A major loophole was uncovered yesterday in the “bash” command shell by the researchers from Red Hat. 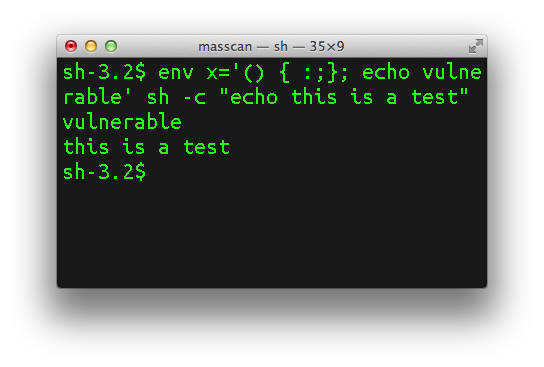 Nicknamed Shellshock, it affects both OS X and Linux users. Apple was quick to respond and, in a statement sent to iMore, said that is aware of the issue, and, to alleviate tension, stated the majority of OS X users aren’t at risk. The vast majority of OS X users are not at risk to recently reported bash vulnerabilities,” an Apple spokesperson told iMore. “Bash, a UNIX command shell and language included in OS X, has a weakness that could allow unauthorized users to remotely gain control of vulnerable systems. With OS X, systems are safe by default and not exposed to remote exploits of bash unless users configure advanced UNIX services. We are working to quickly provide a software update for our advanced UNIX users. Actually, when the loophole was uncovered, security researchers said all Unix-based operating systems across the globe are affected, and that includes OS X. Furthermore, it’s not just the millions of computers, but, in fact, all Internet connected devices will need a software update as soon as possible. Apple is working on a fix and will provide a software update, although, according to Apple, only advanced OS X users are vulnerable to the loophole. For regular users, Apple’s message is clear: don’t panic, your computer is not at risk, just stay tuned and keep your software up to date.